He has recently held solo shows at AJC Gallery in Hong Kong and Manifest Gallery in the US. He has participated in the Hong Kong art prize and also in the Hong Kong-Shenzhen Biennale of Urbanism and Architecture. His works have been featured in 6 out of 7 International Painting Annuals (INPA) published my Manifest press. From 2012, he worked as a Professor of Painting and Foundation Studies at The Savannah College of Art & Design in Kong Kong. David paints on solid, birch plywood panels, depicting vast, expansive spaces. He uses the chemical qualities of oil washes to disrupt, dissolve or decay the image surface. This process of deliberately de-saturating colour and detail enables David to produce works that have a haunting and seemingly romantic atmosphere, but which also speak quietly of environmental erosion, decay, and of shrinking space. Influenced by the negative spaces of Chinese ink painting, minimalism and photographic overexposure techniques, David’s work aims to be open ended, evasive and spare. The paintings play with a desire for the mysterious and the elemental. 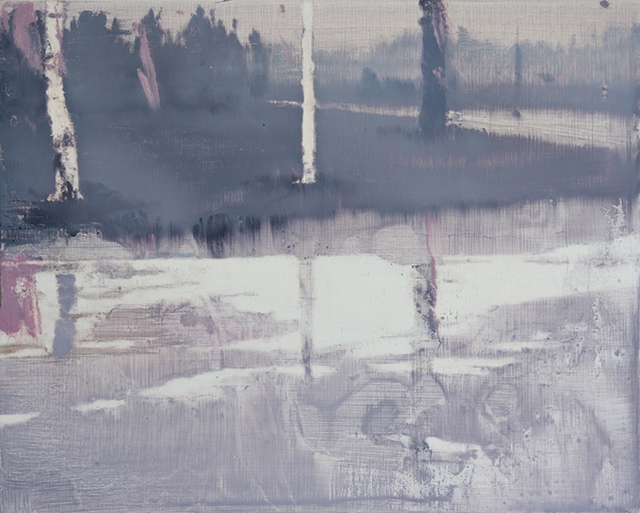 Trees-Park-Rain by David Smith is included in the collection of the Arts Council of Northern Ireland. Visit www.davidsmith-studio.com for further information about David’s work.